The finest hill-walking and scrambling routes on the mountains in Scotland's Western Highlands. 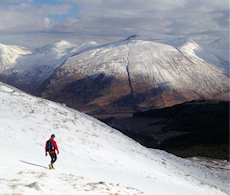 Hill walking routes in the Western Highlands of Scotland are listed below starting from north and working southwards. Varied terrain and peaks with excellent views to Torridon and Skye. Accessed by good tracks. A drive of 12km along a private road with lots of wildlife. Easy walk mainly on fine paths. 12 Munros above beautiful Loch Affic and Loch Mullardoch. Can be done in one long day or split into 3 or 4 outings. A long enjoyable day on three Corbetts above Glen Elchaig. Includes details of a short detour to the Falls of Glomach. The iconic Five Sisters of Kintail and their 7 other neighbouring Munros and 2 Corbetts all described in detail. Varied terrain and fine views with an enjoyable scramble on Mullach Fraoch-Choire. 9 Munros in one long chain. Easily split into 3 or 4 outings or done in one fairly long day. A grass covered little hill surrounded by higher peaks of Kintail, The Saddle and Arnisdale. Easily accessed by a fine path from Shiel Bridge. A sea-level start and steep path make for a good stiff Munro ascent. Easily extended to include the neighbouring Corbetts. One of the more remote and most beautiful areas in Scotland. Accessed by a lovely walk in from Kinlochourn or by boat from the north. 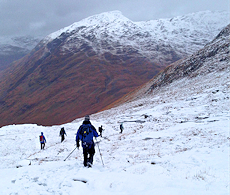 Rugged mountains on the edge of The Rough Bounds of Knoydart with fantastic seaward views. A remote area. Access to all peaks are on fairly good, if sometimes wet, stalkers paths, built well before the construction of the dams. Standing dramatically above Loch Lochy, 2 Munros and 3 Corbetts are accessed using forestry tracks. Sandwiched between the mighty peaks of Ben Nevis and Gulvain, Corbett and Graham peaks rise above Loch Arkaig and the Great Glen. Gulvain and its neighbour Braigh nan Uamhachan are easily accessed via a track from Kinlocheil. Rugged terrain, fantastic views and an enjoyable cycle in and out on a tarred road. A long 'whale-backed' Corbett immediately west of Fort William. Various routes up to stunning views ! No paths, old walls or rusty fence-posts to follow giving this area's peaks a real feeling of remoteness and adventure. A compact group of Corbetts above Loch Ailort. Pathless grassy and rocky terrain with fine views from the summits. A fine Corbett, its solitary position ensures superb views from its summit in all directions. Narrow roads lead to a quiet route up two interesting Corbetts and a Graham with amazing views easterwards over Loch Linnhe.